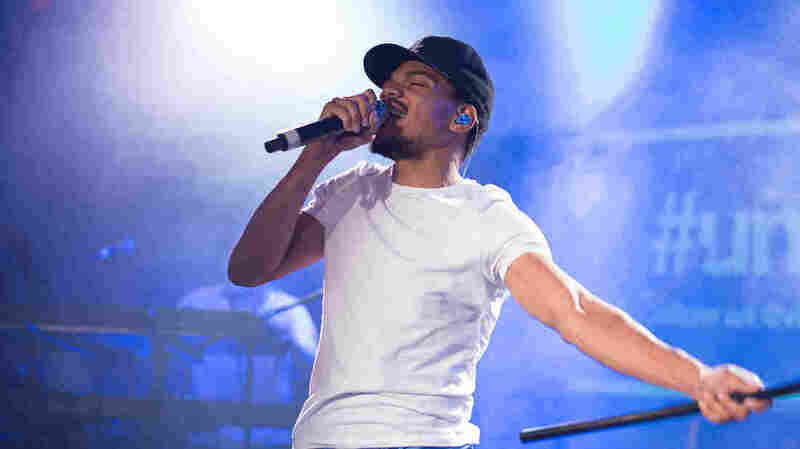 Chance The Rapper's 'Coloring Book' Reveals Shades Of Gospel The Chicago rapper's new mixtape, Coloring Book, walks a line between the secular and the religious, bringing gospel sounds to listeners who may not have darkened the doors of a church in a while. The independent artist from Chicago is a hometown hero. At this point, it's common to see headlines scurry across your Twitter timeline about his efforts to make his city better. One day, he might be supporting initiatives to curb homelessness; on another day, he might be hosting a youth concert to address gun violence. But now, he's on a new mission: taking gospel music mainstream, with his new mixtape, Coloring Book. His plan of attack has been at least a few years in the making. On his breakout tape, 2013's Acid Rap, he and his band The Social Experiment played around with sounds of the church — organs and hand claps and layered harmonies reminiscent of a choir. Chance also used Acid Rap to speak directly about his faith and worship, with crystal-clear lyrics like: "I am a new man, I am sanctified. I am holy, I have been baptized." More recently, on Kanye West's The Life of Pablo, he had a scene-stealing verse on the powerfully spiritual opening track, "Ultralight Beam." Kirk Franklin, one of the most recognizable names in gospel, was also featured. But alongside Kanye, he took a backseat to Chance on the track. With Coloring Book, Chance is taking it a step further. But he's doing it in a way that feels like a test run — like he's easing his listeners into the idea of gospel hip-hop. He calls on the top rappers in the game, like Atlanta's Young Thug and Future, to assist on songs that wouldn't be quite welcome in a church. It's a way to access a crowd that might not have darkened the doors of one in a while. Chance is walking the tightrope between secular and religious, with his devoted followers, who are legion on the Internet, looking up at him. Coloring Book isn't a complete gospel album. But with its myriad influences and creative directions, it's certainly praiseworthy.